Members of UFCW Local 700 who work at the ConAgra tablespreads plant in Indianapolis celebrated their wall-to-wall union status when the last five nonunion workers at the plant joined our union family this summer. The nearly 300 workers at the plant, who produce Reddi-wip toppings and butter spreads like Blue Bonnet, Parkay, Fleischmann’s and Move Over Butter, know we are stronger when we stand together. 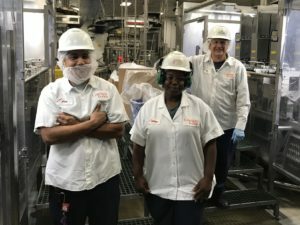 Members of UFCW Local 700 at the plant talked to the workers about the value that comes with joining our union family and encouraged them to join in time to participate in the approval process of a new contract.